Kasey Kahne won the Pocono 500 from the pole, despite 11 cautions & Rain delays, to get to victory lane. At the start of the race Kasey Kahne leads the field into turn 1 with high expectations but the day would prove frustrating for many drivers. On lap 60 the caution flew because of a multi-car wreck, when #10-Carpentier, #38-Gilliland & #77-Hornish Jr. Amazingly #45-Terry Labonte dodged the wreck. On lap 70 Rain brought the Red Flag out, everone had time to contemplate strategy, but no work can be done on the car during red flag delays. One scary incident occured on rit Road when #16-Greg Biffle hit a crew member and then gets tagged by #26-Jamie McMurray. On lap 129 Kasey Kahne took the lead away from Jimmie Johnson. And only dropped to 3rd place once before the end of the race. 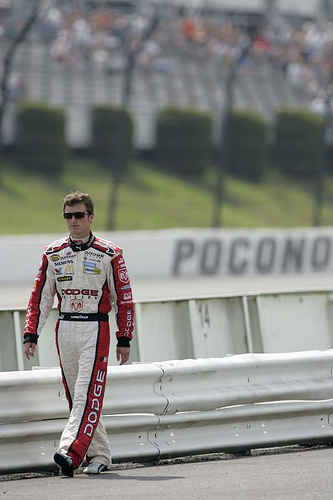 Kasey Kahne re-took the lead at the end and wins from the pole at Pocono! Check NASCAR.com for a list of complete results. Next up: Michigan International Speedway. WHO TO WATCH FOR AT MICHIGAN? Kyle Busch, Dave Blaney, AJ Allmendinger, and Kasey Kahne.